JAKARTA, Indonesia (CNN) -- Authorities in Indonesia released sketches Wednesday of two men believed to have carried out last week's bombings at two luxury hotels in Jakarta. 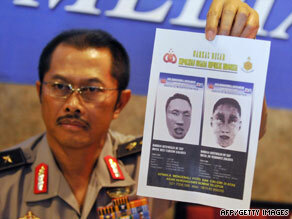 Indonesian police spokesman Nanan Sukarna shows a sketch of the suicide bombers in Jakarta on Wednesday. One was about 40; the other 17, officials said. Analysis of their DNA matched that obtained from a homemade explosive found in a room at the Marriott Hotel where they had checked in, police said. But authorities still do not know their identities. The blasts last Friday at the Ritz Carlton and JW Marriott killed nine people -- including at least two presumed suicide bombers -- and wounded more than 50. The bombings happened shortly before 8 a.m. (9 p.m. ET). Both blasts struck the hotels' restaurants and several prominent international business leaders were among the casualties. The hotels -- which are connected by an underground tunnel -- are frequented by international visitors and many foreign nationals. It is unclear how they got around the security at the hotels, according to Alan Orlob, security chief for Marriott Hotels. Ritz-Carlton is a subsidiary of Marriott.